Calling all Lily-Gilders, Tassel-Hangers and Glitter-Sprinklers… this is SO your kind of jewelry! Achieve elegant results in Soutache & Bead Embroidery. Adventurous Beginners will learn all the Basics including Aligning & Stacking, Shaping Stitches, Ending Stacks, Backing & Edge-Beading and creating Peyote Stitch Bezel. 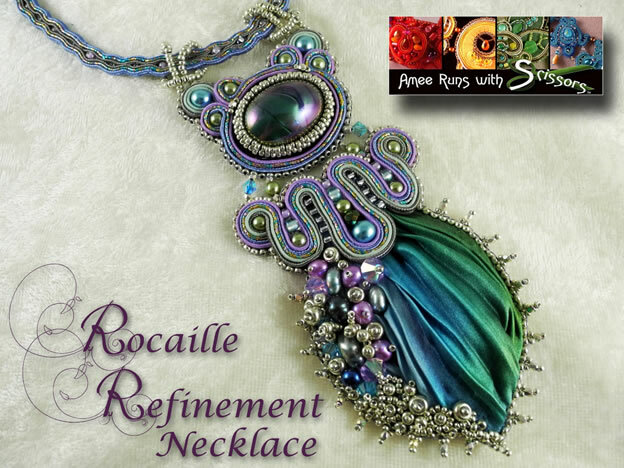 Those with more experience will be fascinated by new techniques including sculpting with Shibori ribbon, connecting components and creating a sturdy-but-delicate-looking captured-bead chain – a technique that can be used again and again in future soutache projects. Students should come to class with a surface to bead on (bead board or bead blanket), good, sharp scissors and any magnifiers or extra task lighting desired. To complete the work, students will also need pliers, flush-cutters and looping or rosary pliers. Projects will not be finished in class but every kit comes with Amee Runs with Scissors’ full-color, “Whole Story” step-by-step instructions making it easy to finish the project at home. Kits will be provided in five different color-ways. Please print or type all information. Please be sure to complete all sections of this form. It is important that you fill out the form completely and correctly. Please contact the Registrar if you have any questions regarding this form. Registration is open immediately and closes on February 1, 2019. See class description for other tools that are specifically mentioned by Amee. NER EGA members will have preference followed by EGA members. Non-EGA members will be enrolled if there is room. Class space is limited to 24 students. Please note – no meals included. There is a Bistro at Seabury and restaurants in the surrounding area. I release The Embroiderers' Guild of America, Inc. and the New England Region EGA from any liability for any related financial loss, theft, property damage, or personal injury resulting from registering or participating in, attending any or all functions at the workshop, and traveling to and from the workshop. I understand that a cancellation request must be made in writing by March 20, 2019. Cancellation after March 20 will result in a refund of $80.00 and the kit. Kit fee cannot be refunded after this date. ❀ Check or money order payable to: NER EGA for the total amount due. ❀ A #10 business size SASE for confirmation if you do not do email. PLEASE PHOTOCOPY BOTH SIDES OF THIS FORM FOR YOUR RECORDS.